Bill Santoro battled melanoma for about a year, and on April 20, 2012 he passed away from this horrible disease. He was born in the Bronx, New York on April 27, 1955. He was only 56 years old. He started his career in Smithtown, New York in 1984, as a Broker in Real Estate. 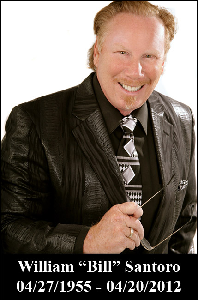 After moving with his family to California in 1988, Bill became a successful Real Estate Broker in the Riverside area receiving many awards as one of the top Brokers in the area. Bill had a real passion for Real Estate. The love of his life, Carol, who he was married to for 27 years, worked side by side with him in the industry. As for his son, Stephen, he was very proud of him and all of his accomplishments. He loved both of them dearly. He was a patient man with strong character and commitment to his family. He touched many peoples lives with his confidence and positive attitude. We will all miss his smile and his love for life. For such an amazing man, he was taken to soon. If you would like, you can add your name and a short message to our Guest Book. Please, post with respect, this is for fundraising for all who have passed from cancer. Your gifts are for all who are going through such a horrible disease. Valuable information. Fortunate me I found your site unintentionally, and I'm shocked why this twist of fate didn't took place in advance! I bookmarked it. It's actually a cool and helpful piece of info. I am glad that you shared this helpful info with us. Please stay us up to date like this. Thank you for sharing. I your writing style really loving this internet site. Hello, I think your website might be having browser compatibility issues. When I look at your website in Firefox, it looks fine but when opening in Internet Explorer, it has some overlapping. I just wanted to give you a quick heads up! Other then that, terrific blog! You're so interesting! I do not think I've read through a single thing like this before. So wonderful to discover somebody with some genuine thoughts on this issue. Really.. thanks for starting this up. This website is one thing that is needed on the internet, someone with a little originality! Hey there, I think your website might be having browser compatibility issues. When I look at your website in Opera, it looks fine but when opening in Internet Explorer, it has some overlapping. I just wanted to give you a quick heads up! Other then that, excellent blog! Why users still make use of to read news papers when in this technological world all is presented on net? Hmm it seems like your website ate my first comment (it was super long) so I guess I'll just sum it up what I wrote and say, I'm thoroughly enjoying your blog. I too am an aspiring blog writer but I'm still new to everything. Do you have any points for beginner blog writers? I'd definitely appreciate it. Whats up very cool website!! Guy .. Beautiful .. Amazing .. I'll bookmark your website and take the feeds additionally_I am happy to seek out so many helpful information here in the post, we'd like develop more techniques in this regard, thanks for sharing. I every time used to study article in news papers but now as I am a user of web thus from now I am using net for articles or reviews, thanks to web. I always used to read piece of writing in news papers but now as I am a user of net so from now I am using net for articles, thanks to web. Well I truly liked reading it. This article offered by you is very effective for proper planning. Hi there very nice website!! Guy .. Beautiful .. Amazing .. I will bookmark your blog and take the feeds additionally_I am glad to search out a lot of useful information right here within the put up, we want work out more strategies on this regard, thank you for sharing. Some really excellent information, Glad I found this. Well I definitely enjoyed reading it. This post procured by you is very practical for good planning. Some really excellent information, Sword lily I found this. quality calvin ( %url ) articles is the key to attract the people to pay a visit the web page, that's what this site is providing. Thanks a lot for being my personal teacher on this area. We enjoyed the article quite definitely and most of all liked the way you handled the issues I considered to be controversial. You happen to be always incredibly kind to readers like me and let me in my lifestyle. Thank you.